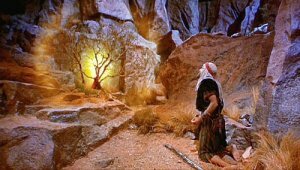 Did Yahweh Come From Midian? Where did Yaweh come from? Much has been written about the roots of Israelite religion in the mythology of the Northwest Semitic world. Yet a significant, alternate notion is rooted in the Hebrew Bible that instead connects Yahweh with the south – a persistent association with “Teman,” “Seir,” and “Paran” as described in Deuteronomy and the Book of Judges, and by the prophet Habakkuk. As preserved in the Hebrew Bible, these traditions suggest there were worshippers of a God named Yahweh who preceded the Israelites, and whose domain was centered in the deserts to the south of Eretz Israel. As these traditions were themselves very old and quite durable, a strong case can be made for their historical accuracy, including the probability that the name Yahweh entered into Israelite religion from these early sources. Extra-biblical evidence also corroborates non-Israelite Yahwism in the “South”. This evidence includes Egyptian texts, inscriptions from Israel, and a full reconstruction of the religion of Midian from archaeological data. For more information, please contact BAF.JCCGW@gmail.com. Subscriptions for the BAF 2017-2018 lecture season are coming soon.